As I said in my last post, my mom came to visit us here in Vietnam last month. It was such a great visit and we packed a lot in to the 2 weeks. Our first trip that we took was down to Hoi An for 4 days. Luckily my niece Sarah, who lives in Singapore, had a long weekend so her and her fiance joined us for a couple of days. How do I describe our time in Hoi An? Wow… Let’s just say it was full of shopping, tailoring, eating, boat rides, bike rides, beaches, rice paddies, swimming, temples and more! 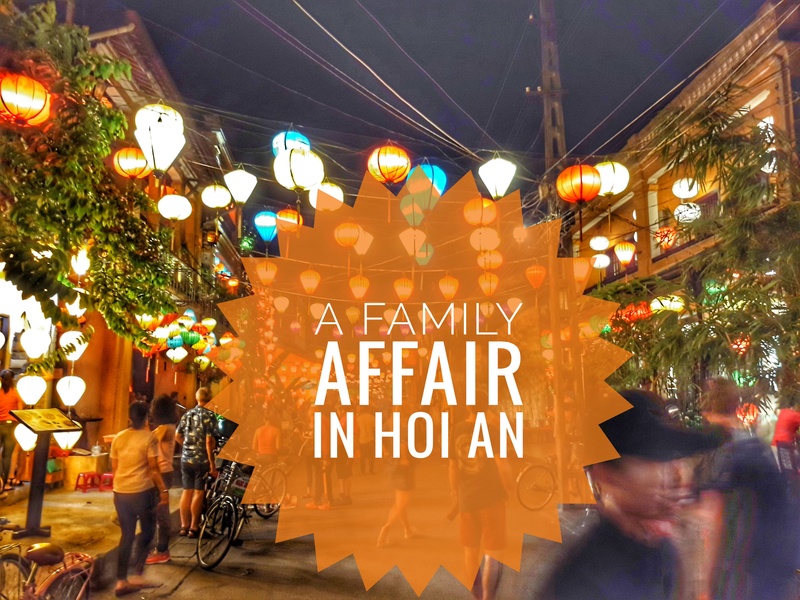 In this post I’ll just talk about Hoi An town itself. Hoi An is a traditional town with beautiful old buildings and lanterns absolutely everywhere. It is very peaceful since no motorised vehicles are allowed in to the town center. I must admit that it is very touristy with every building being either a shop, tailor or restaurant, but I absolutely loved it there! 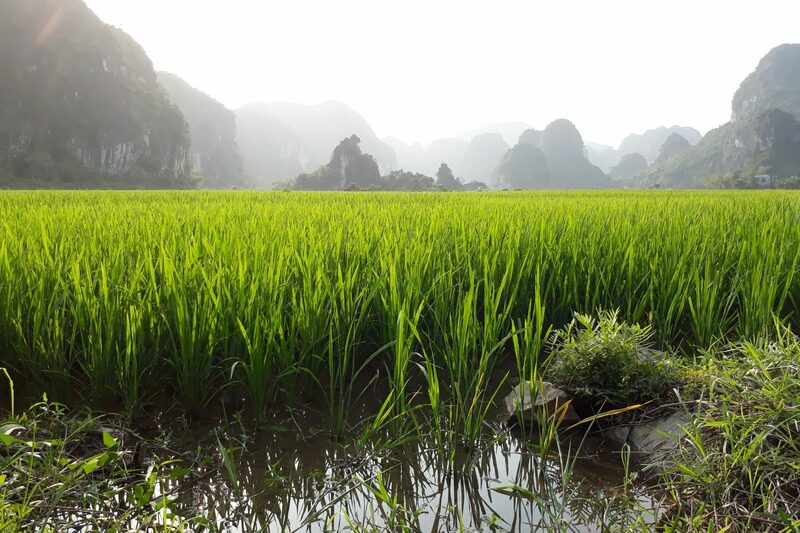 It was such a nice getaway from noisy Hanoi. So I have mentioned tailors a couple of times so far in this post and that is because Hoi An is THE place to go to get clothing tailored. While we were there I got some beautiful leather ankle boots, a dress, a pants and shorts tailored. Jason got a pants and 4 shirts tailored and my mom got 3 pairs of shoes made. Overall we were happy with the items that we got made. For my dress and one of Jason’s shirts we went to one of the bigger well known tailors that had a lot of reviews. Then while walking we happened upon a very small tailors with a lovely woman inside, she was offering to make shirts at a much cheaper price so Jason said he’d order one and see how it went. The next day we went back and found that it was perfect, no adjustments needed, unlike the bigger store so we ordered more from her and were happy with everything we got made. Now, a month later, the pants and dress have become staples in my wardrobe, I’ve only worn the boots once because it’s summer but they looked beautiful. I still haven’t worn my shorts but I’m sure that I will soon. Jason found all of his shirts very comfortable and perfect for work. The name of the tailors was Thu Linh 2 and the address is 40 Tran Phu Street. There are thousands of tailors in Hoi An but this is my recommendation. As for my boots. I love them! I got them made at Friendly shop (18 Tran Phu). They are quite well known for making quality leather products and they offer a 6 month guarantee. I can’t wait to write more about our time in Hoi An, especially the different day trips that we took! Have you ever gotten anything tailored? I’d love to hear about your experience!